I was thrilled to get my copy of Writing Urban Space: Exploring the relationship between imaginative writing and the built environment, edited by Liam Murray Bell and Gavin Goodwin, this week. The book brings together papers from a conference at the University of Surrey a couple of years ago. 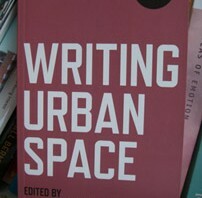 It includes an essay by me about UrbanWords, called Can Writing Shape Place? And one by the fabulous Rosa Ainley. You can get hold of a copy directly from the publishers.